Prime Minister Justin Trudeau has directly addressed allegations of "groping" a reporter at an event 18 years ago before he was involved in politics, saying he does not recall any "negative interactions" that day. 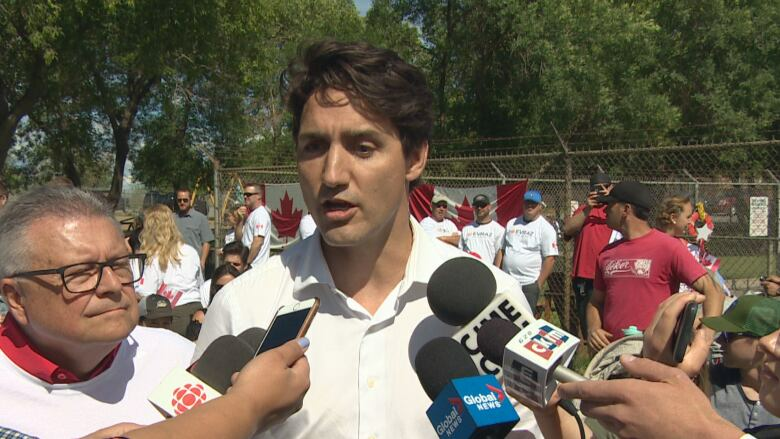 During a stop in Regina on Sunday, the prime minister was asked about an allegation dating back to 2000, when a 28-year-old Trudeau, then a teacher, was visiting a music festival in Creston, B.C. The incident is alleged to have taken place at the Kokanee Summit, where money was being raised for the Avalanche Foundation, a charity Trudeau became involved with after his brother, Michel, died in an avalanche in 1998. An unsigned editorial appeared in the Creston Valley Advance after the event accusing Trudeau of "groping" and "inappropriately handling" a young female reporter while she was on assignment. It suggests the woman felt "blatantly disrespected" but provides no other details about what occurred. "I remember that day in Creston well," Trudeau told reporters Sunday. "I had a good day that day; I don't remember any negative interactions that day at all." The prime minister made the comments while visiting supporters and steel workers in Regina as part of a three-city Canada Day tour. Earlier this year, CBC News spoke by phone and emailed with the woman who was the subject of the editorial. She said she was not interested in being associated with any further coverage of the story. She also asked that her name not be used and that she not be contacted about the story again. A former co-worker remembers the reporter's account of the encounter. Valerie Bourne was the publisher of the Creston Valley Advance at the time and says the reporter was "distressed" by her contact with Trudeau. "My recollections of the conversation were that she came to me because she was unsettled by it. She didn't like what had happened. She wasn't sure how she should proceed with it because of course we're talking somebody who was known to the Canadian community." Bourne told CBC News that the reporter was interviewing Trudeau when he touched her. "It was a brief touch," said Bourne. "I would not classify it or qualify it as sexual assault." The paper's editor at the time, Brian Bell, also spoke to CBC News. "I don't recall that the reporter was coming across as having been traumatized or distraught about it, but definitely that, whatever physical touch or whatever had occurred in that moment was definitely not welcome and definitely inappropriate. "I certainly believe that it happened, this reporter was of a high character in my opinion and was professional in the way she conducted herself and there's no question in my mind that what was alluded to, written about in that editorial, did happen." Bourne believes the editorial was written by the reporter herself. Both Bourne and Bell say they did not write the editorial and that it must have been one of the two reporters on staff. The second reporter, Paul Frey, told The National Post that he didn't know anything about it. The editorial suggested that the day after the incident Trudeau offered an apology of sorts: "I'm sorry," he is quoted as saying. "If I had known you were reporting for a national paper I never would have been so forward." The account stands in contrast to Trudeau's own comments about his past. In an interview with CBC Radio's The House in January, host Chris Hall asked Trudeau about the topic of sexual assault and sexual harassment. Specifically, Hall asked if there was a chance that at some point some Trudeau's own actions might have been misconstrued. "I don't think so," Trudeau responded. "I've been very, very careful all my life to be thoughtful, to be respectful of people's space and people's headspace as well," Trudeau said in the interview. That interview came as Trudeau was dealing with allegations of harassment by one of his ministers. He was asked if he held himself to the same standard he holds his own caucus members to. "There is no context in which someone doesn't have responsibility for things they've done in the past."